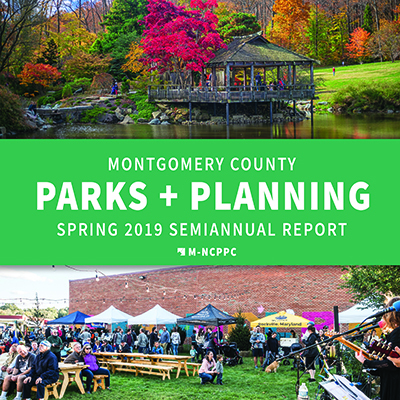 SILVER SPRING, MD – The Montgomery Parks and Montgomery Planning Departments, part of The Maryland-National Capital Park and Planning Commission, presented their Spring 2019 Semiannual Report to the Montgomery County Council on Tuesday, April 2, 2019. The report, available online, showcases key projects, park activities and plans from the past six months, and initiatives that will be completed over the next six months and beyond. View the Spring 2019 Semiannual Report. Director of Montgomery Parks Mike Riley emphasized the efforts to bring more people into the parks through festivals, movie screenings and interactive installations. “Our priorities for conserving natural resources, engaging residents in wellness and healthy activities, and fostering social equity are being achieved through expanded programming for the county’s diverse populations,” said Riley. At the Council meeting, preservation planners explained the new Burial Sites Inventory and Guidelines. As required by county law, the Montgomery County Planning Board must maintain this survey so cemeteries and burial sites can be identified during the preliminary plan stage of the parcel subdivision process, which is overseen by the Board. Montgomery Planning’s Historic Preservation Office is responsible for maintaining and updating the inventory, providing guidelines for archaeological investigations and engaging the community in the process of identifying and preserving sites. The seminal planning guide for Montgomery County, the General Plan, was adopted in 1964, revised in 1993 and is being updated in 2019 to reflect and proactively plan for demographic, technological and social changes in our communities. A new research study, Montgomery County Trends: A Look at People, Housing and Jobs, was released in January 2019 to reveal notable demographic and economic changes over the past 25 years. This data will help inform the direction of the General Plan Update. Montgomery County’s Vision Zero policy to eliminate traffic fatalities and severe injuries by 2030 is being implemented through several plans. The Bicycle Master Plan, Veirs Mill Corridor Master Plan, MARC Rail Communities Plan, Aspen Hill Vision Zero Study and Forest Glen/Montgomery Hills Sector Plan recommend ways of improving pedestrian and bicyclist safety and better connecting neighborhoods along busy arterial roads. New community-focused efforts to turn parking lots into places include the White Flint Placemaking Festival, held in October 2018 to transform part of the Randolph Hills Shopping Center in Rockville into a pop-up park. The new Burial Sites Inventory and Guidelines are being maintained by Montgomery Planning’s Historic Preservation Office to ensure cemeteries and gravesites are identified during the development review process. Community meetings held in April 2019 will inform the public about the inventory and guidelines, and planners will solicit feedback. Efforts to achieve Vision Zero include safety improvements to 121 priority trail and roadway crossings by 2030. In 2019, four projects have been completed and eight additional upgrades are underway. The final phase of the Powerline Trail, undertaken as a partnership with the Potomac Electric Power Company and Mid-Atlantic Off-Road Enthusiasts, is underway for completion in 2020. The last leg of the natural surface trail will double its distance to connect Quince Orchard Road to Cabin John Regional Park. A pilot program launched in spring 2019 will allow e-bikes and e-scooters on trails within the county. Public feedback about the pilot will help determine its success and the feasibility of making the program permanent. Design guidelines are being developed for the Energized Public Spaces Functional Master Plan to recommend the sizes, features and amenities provided by each park. Work with the Montgomery County Department of Environmental Protection on stream restoration projects in Grosvenor, Stoneybrook, Glenallan and Clearspring parks will begin in spring 2019 to improve water quality.